Savannah officially admitted by the International Association of cats (The International Cat Association - TICA) to register as a breed of domestic cat in 2001, is today considered one of the rarest and most expensive breeds. Savannah History (English name of the breed - «Savannah») began in 1986 when the Bengal breeder Judy Frank of Pennsylvania , noting that belonged to Susie Woods male serval , an African wild cat, bored , decided to brighten his loneliness Siamese society . Judy Frank unexpectedly as a result of this "friendship" April 7, 1986 was born the only female kitten , which Susie Woods , who became the owner of the kitten , named " Savannah ". This kitten has become the first child of a hybrid generation (F1) and the first registered representative of a new breed of cats that Susie Woods later also called savanna. While no experience producing hybrids serval , therefore, received the offspring of an African Serval and a domestic cat , Susie suggested that it is possible to breed and from mating with her ​​Savannah house cat . Susie assumption was confirmed , and Savannah was born several litters of kittens that are considered hybrids of the second child generation (F2). Thus , Susie Woods proved that from the first generation hybrids ( from mating serval and domestic cat ) can be produced offspring , and the new breed can be created. Susie Woods wrote two articles about breeding savannah . Unusual breed interested Patrick Kelly (Patrick Kelley), who suggested Susie Woods and Judy Frank start a joint breeding program savannah , but neither Heather Woods nor Judy Frank showed no interest . Then in 1989 Patrick Kelly purchased from Judy Frank sole female kitten who was born from Savannah , and began a breeding program , proposing to focus on creating a new breed servals several breeders , of which only showed interest Srauf Joyce (Joyce Sroufe). At this stage, was obtained from the offspring daughter Savannah. These kittens have become hybrids third child generation (F3). Encouraged by the results obtained , Patrick Kelly and Joyce Srauf wrote the original version of the breed standard , which in February 1996 , they presented the Council TICA. In 1997, Joyce Srauf introduced a new breed of cat show in New York , becoming the recognized founder of the breed. Thanks to the efforts of Patrick Kelly and Joyce Srauf breed gained popularity , and they had many adherents among breeders . In 2001, hybrids serval and domestic cat were allowed to register . In 2003, Savannah received provisional status of the new breed , and in May 2004 - a new breed of advanced status , which , under the rules of TICA, the second of three levels , which are a new breed in the process of their creation to champion status. Currently savanna , since hybrids third child generation (F3), exhibited at TICA shows in the class of advanced new breeds . According to 2005 were registered in TICA 1023 savannah , though among the registered was not spayed or neutered animals. In 2009, it was still registered in 1020 savannah , and in 2010 - 325. In TICA was organized and successfully operates section breeding savannah , who previously headed Lorrie Smith (Lorre Smith), who made a huge contribution to the breed and its development. It is largely thanks to the participation Lorrie Smith savanna creation as a new breed of cats , was the fastest in the history of TICA. Currently section directs Carol Streit (Carol Streit), under whose leadership the breeders continue to work for tribal status award savannah cats breed titles at TICA shows in the coming years ..
Savannah ( breed code , adopted in TICA - SV) is a hybrid breed, obtained from mating of a domestic cat and serval (Leptailurus serval), African wild cat of medium size, which lives in the savannas of Africa that their Susie Woods time prompted a name for the new breed. serval easily tamed , as people has been known since ancient Egypt . By this serval reason often contained in an exotic home pet that , however, are not currently recommended by the experts since any case serval is a wild cat , and therefore unpredictable and difficult to Content in the home. One of the main differences from the serval other wild cats that serval not consider man as production - fact especially attractive to breeders who breed hybrids wild cats and domestic cats breeds creation based outcross with wild cats. However, serval - a wild cat , ie predator family feline. As with any wild cat hybrids in breeding savanna there certain features characteristic of the hybrid breeds when breeders aim to not only create a domestic cat breed that maximally phenotypically resembled to its wild ancestor , but would have a calm sweet temper and temperament of a domestic cat . In the early generations of savannah usually some degree of hybrid non-viability , which is manifested in sterility ( futility ) serval cats hybrids to the fifth generation (F5), which were castrated and transmit new owners as pets . 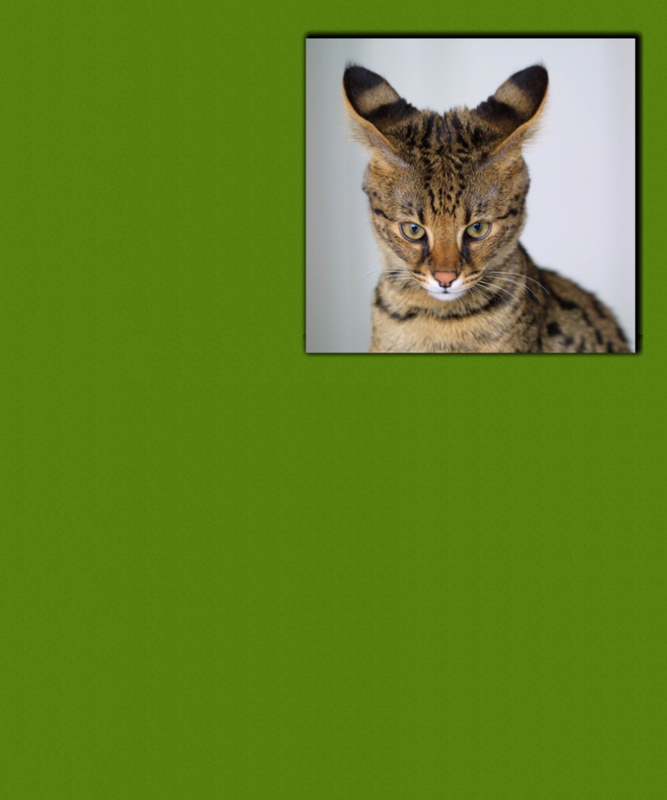 Savannah cats usually knit with savannah cats F5 ( fifth-generation hybrids ) . Such dilution accepted called viscous savanna with savanna. Also acceptable outcross cats savanna with purebred domestic shorthair cats, and cats such breeds as egyptian, Oriental Shorthair, Ocicat and Bengal cat in which is one of the major spotted coat. And if the first three breed were derived from domestic cats , the Bengal cat is hybrid rock resulting from purposeful crossing wild Bengal cat (Prionailurus bengalensis), which used to be called Asian leopard cat (Felis bengalensis), with domestic cats . In addition, there are cases where beautiful cats were obtained from outcross Serengeti savannah with , although these are not recognized outcross TICA, as serengeti - is another new breed recognized by TICA cats received from outcross two breeds of domestic cats - Bengal and Oriental Shorthair . Some breeders carried mating F1 Savannah cats with males serval , resulting in progeny which they noted 75 % genes serval . However, it should be noted that the scientific method can not be measure percentage of genes in a given serval savannah so sequence number generation hybrid is not an indicator of interest content of genetic material serval , which is contained in specific animal. Moreover , the fertility of animals questionable. Savannah F1 ( hybrids of the first generation child ) is very rare, so they are more expensive savannah all subsequent generations . Very difficult to get healthy and viable outcross progeny from serval and a domestic cat , which is associated not only with Serval intelligibility in choosing a partner , but also to a greater extent because of large differences in size, and also because of the difference in pregnancy domestic cat and serval . It should be emphasized that according to the rules of TICA savannas considered only animals that have three-generation pedigree TICA, although in common usage and savannas called feline not only breed cats savannah recognized TICA, but hybrids serval and domestic cat all child generations. Gestational age of the domestic cat is about 65 , and serval - 66-77 days. Due to differences in pregnancy hybrids earlier generations often born prematurely and require special mother care . The litter hybrids of the first and second generations born kitten usually 1-2 , while savannah hybrids subsequent generations - 3-5 kittens. Although savanna may become pregnant within 4-5 weeks after birth , breeders usually limit to two the number of litters per year. Savannah - feeding mothers kittens milk for 8-12 weeks. First 8 weeks of life, kittens savannah lot almost constantly asleep. During sleep, the body produced kittens hormones growth, so it is best not to disturb the kittens and not wake , as it may hinder their normal growth . In the weeks that followed their dream becomes less long and deep. Therefore it is better to leave the kittens mother in first months of life . Although savannah cats to the fourth , and most cases to the fifth generation are usually sterile , they also castrated at an early age that they are not labeled , and were more domesticated . Breeders in the United States , following recommendations TICA, usually castrated or sterilized by kittens they reach age 10-12 weeks so that the 12 - 16th week pass kitten new owners. Moreover, at this age the kitten is accustomed to chute , vaccinated , eating independently and communicates with people and other animals , ie the new host should not be too much trouble with him . So far, there are no exact data when puberty occurs in savannah , but the serval sexual maturity at the age of 18-24 months. Tips new owners savannah in general coincide with the advice to owners kittens other breeds. However savannah kittens are more mobility so they need more toys . In this preferred comply small distance to avoid scratches and bites. For example , a toy made ​​of feathers can be suspended on a thin stick , like a fishing rod . Savannah love jump especially Savannah F1 and F2, which should also take into account the new owner . except of savannah kittens are very curious , so until the age of seven months , until kittens teeth have not changed , you should protect electrical wires and small ornamental details of the interior. It is important to remove from the premises to which at kitten has access , plants that are considered toxic to cats. In the first time it is not recommended to change the diet, which was used kitten , being at the breeder . If necessary, the diet should be changed slowly gradually. The main thing that was highly nutritious food in the early years life, savanna growing rapidly. Many breeders recommend feeding raw savannah meat, since it is believed that the dry fodder causes kidney problems. it explained that if a cat eats dry food , she should drink a lot more of water, What if she eats natural meat products . Furthermore, dry stern often used vegetable fillers , so the owner savannas, admiring her "wild" appearance, must realize that the vast African savannah serval , one of the most successful hunters of cat , do not hunt for food plant , so minced meat would be best choice for diet savannah. However , one of the best recognized breeders savannah Catherine Stuckey believes savannah can feed standard qualitative feed for cats. Therefore , I think that should continue to feed the savannah same , than fed breeder . Savannah various subsidiaries generations differ because of what future owner should be to decide on the savannah which generation he will provide care and nutrition. Savannah - first-generation hybrids , being large cats need large size trays with sand, large smokers for games, less fragile home furniture , as well as people who like a lot play with them. Large savanna run fast , jump high, inverted and drop them on the floor , many items that are on their way . if lover savannah is not ready for that cat will chetyrnadtsatikilogrammovaya boom running around the house , he or she is better to opt for a for small size savannas fourth, fifth and later generations subsidiaries . except Furthermore, in some states do not allow content in hybrids wild animals, including hybrids serval earlier generations . For example, in state New York savanna up to the fifth generation are not considered household cats. If savanna never left the house , then it will not be of interest to what is happening outside , just as in the case of other breeds domestic cats. However , savannahs love to walk outside the house , that means that the host leads savannah walk on the harness . In no case must not produce savannah walk one that can lead to various negative consequences for both animal and owner . good substitute walks outdoors can be a walk in the house adjacent to the aviary. also savannas like riding in a car , as their sense of balance is not such as in other domestic cats. Savannah - a smart and very curious cat . To meet its curiosity , they love themselves open doors to rooms and closets, to nominate drawers. Savannah behavior is often compared with the behavior of dogs , including their devotion. Savannah should be throughout the house for the owner, like a dog. Savannah and well high jump, so savanna can jump from place to a height of 2.5 m and above. they jump on doors , refrigerators , cabinets and shelves. Savannah is not afraid water, and , on the contrary, it attracts them . Some owners even have a shower together with their savannahs . Savannah's first generation hybrids may show wild behavior . They can hiss and growl at strangers. they also can publish chirping sounds like a loud hiss or serval as serval . Savannah can welcome host lightly pushing it head - " bodayas " or by gently grasping claws. Although the behavior of savannah hybrids first generation (F1) and savannah hybrids of the second generation (F2) can not be called aggressive , they usually do not talk to strangers and children. at sight stranger savannah F1 may hiss or hide. savanna F1 or F2 will love to play with one or two family members , but it will not sit on knees will not allow her to take on your hands or patting on head. A trip to the vet with savannah F1 or F2 may also not be of pleasant for savanna and for the owner. More suitable for home cats behavior demonstrate savannah hybrids third generation (F3): they will sit on the lap of the owner and allow yourself to stroke the head. 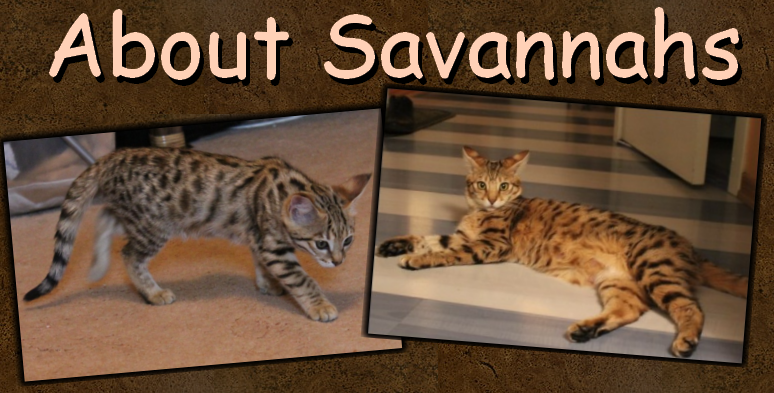 But Savannah hybrid fourth generation (F4) and the actual savanna , ie savannas, having TICA pedigree with at least three generations savannah ancestors (SBT), will be happy to watch the strangers will not be hide and their behavior will not differ from that of other domestic cats . but if compare domestic cats and savannah , savannah even SBT differ more activity and mobility. Special health problems in savannah not observed except problems common to all domestic cats that are resolved timely vaccination regular veterinary care and examination, full quality food and proper care . Noting sterility ( futility ) serval cats hybrids to the fifth generation (F5), breeders and researchers point to the effect of heterosis ( hybrid force) in savannah , the results of which are opposite results were observed in many "old" rocks domestic cats close inbreeding or inbreeding , leading to homozygosity and inbred depression. The largest and cats valuable are the first three generations (F1, F2, F3). F4, F5, SBT size of a normal large domestic cat breeds. show themselves and compared with other domestic cats and breeds.